CHILDREN’S COMEDY. In this wacky adaptation of “Snow White,” a villainously vain Queen tries to kill her lovely stepdaughter, Adorabelle, with a poisonous hair scrunchie. 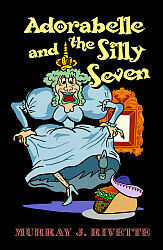 But when the Silly Seven foil the evil plot, the Queen disguises herself as a Sacko Belle food vendor and convinces Adorabelle that she must try the new Sacko Belle chalupa—the new poisoned chalupa, that is! But luckily for Adorabelle, Prince Ethelbert Von Heimlich III, a stand-up comedian on his way to do a gig at Cinderella’s palace, takes a wrongturn.